These culinary creations will bring to your palate the taste of Italy, Spain up to the Atlantic coast often combined with local hints. Describing in 3 words - variable, delicate, simply unforgettable. All prices are quoted in Polish zloty and include government taxes. Service charge included, gratuity at your discretion. Unimaginably delightful soups will serve as an inspiration for further menu explorations. Heaven to your palate. Healthy & light compositions of freshest ingredients coated in different spices, topped with delicate sauces and featuring delicacies like for example, Burrata Mozarella. You can't miss it! Culinary magic on a plate inspired by finest recipes of our Executive Chef & his Team. All our dishes are prepared by sourcing the very best of meats & seafood, home-made pasta & freshest vegetables. 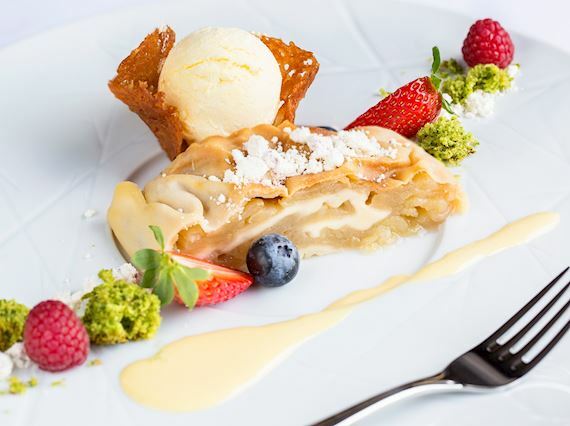 Finish off your culinary journey in our Roof Top Terrace & Lounge Bar with one of our mouth-watering, delicious desserts.